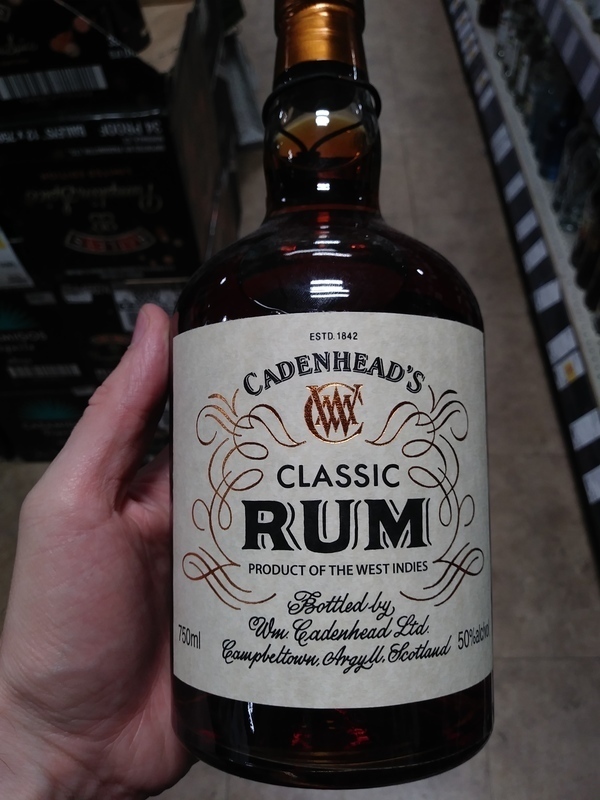 Have you found an online vendor selling Cadenhead's Classic Rum? A 5-year-old blend of rums from Barbados, Guyana, Jamaica, Panama, and Trinidad. 50% ABV. A: Dark (uncolored) with bits of sediment from the welcome lack of chill-filtering. N: salted caramel, oak. Bananas and mangoes. Hint of funk. P: Same as palate, along with some cola (spices?). This rum's got some bite. The youth shows here, but it's not at all unpleasant. Delicious freshly poured, but responds well to 15+ minutes breathing. Warming. F: medium-long; astringent but lingers for a while. Well...... put on your cowboy boots this stuff has a kick. This is a rum purest rum, no artificial flavors or back sweetening. At 50%ABV it has some kick, typically for a rum of this strength i can still drink it neat, but i put on the wifes pantyhose and added a few drops of water which in truth opened up the grog. Has a great nose, decent mouth but the finish will burn thru platinum. Good yes, great no but for $60 uhhh i would pass. Enjoyed a glass of Cadenhead's Classic rum with my friend during a 5,000 mile road trip across 18 States. Bottle and label design looks okay but nothing special. Dark amber color. Very strong and offputting oak and glue straight to your nose and palate. Nasty burn at the end. Better mix this one up. a slow sipper to get all of the flavors and aromas. Assez costaud et ruff avec son 50% alcool. Nez épicé et caramel. Type whisky. Manque de finesse et de complexité pour un rhum de ce prix.